Manufacturer Warranty: 01 YEAR REPLACEMENT WARRANTY AGAINST ANY MANUFACTURING AND FUNCTIONAL DEFECTS. 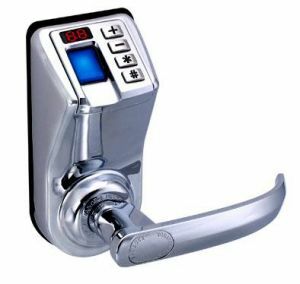 This types of locks are used with normal mechanical Door locks to convert it into Finger print based electronic unlocking system. Unlike keyed locks, with the fingerprint door lock there is no need to take the keys with you when you go out without necessary of worrying about losing keys. Protect your family by locking up firearms and other harmful items. Give housekeepers and friends temporary PIN access that can be changed at any time - without replacing the lock or worrying about whether or not the key was duplicated. Secure server closets or equipment rooms. Secure offices that contain customer's personal information. Allow users to access secure areas without keys, pin numbers or cards.